Sequallity Limited have the experience, skills and certifications in SQL Server Consulting from SQL Server 2008 right up to SQL Server 2017. Established in April 2005 and with over 750 SQL Server Consulting engagements servicing the whole of the UK, and including Europe and America, Sequallity can provide excellent proven SQL Server Consultants for you. About 90% of our clients use us for repeat work so you can be sure you are getting solid, trusted SQL Server support. Call us on 020 3507 1989 or 01604 659 799. 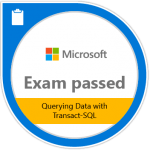 Sequallity's lead SQL Consultant has 24 years of database experience and 19 years have been spent specialising in Microsoft SQL Server consulting, help and training. Not only can we configure and maintain SQL Server correctly for your particular environment but we can also refactor poorly performing T-SQL queries, add missing indexes and speed up your SQL Server if you have a performance issue. We've done this already at many client sites. Standard and bespoke training for SQL Server and Power BI, you can pick and mix! Therefore we can help from specifying hardware, SQL Server Health Checks to high availability, disaster recovery and database maintenance set-up help. We can offer cover for your staff or boost your IT staff during SQL oriented projects. We offer Advice, Implementation and Training. Whatever you need. We can work with any version from 6.0 upwards; including 2008 R2, 2012, 2014, 2016, 2017 SQL Azure, SQL Server AWS RDS or EC2 and now SQL Server 2019! is but one of our specialities. We understand how SQL Server works at a low level, thus allowing us to understand where problems occur. Full documentation will be produced for your system, if required, detailing observations and recommendations. We look at hardware, server configuration, disk configuration, software configuration, database configuration, queries and index analysis too. We can implement or instruct your staff on making these changes. The NHS and Tesco have benefited from our experience. One of our clients had a problematic 46 second query and after our tuning it dropped to 0.65 seconds. For a well-known high street retailer, we managed to get their 50-hour plus overnight process, which needed to be ran and complete nightly, down to 2 hours and 20 minutes. Now, it's not just any non-completing overnight process. are other key areas. With a new bi-yearly release cycle your SQL Server can become out-of-date and unsupported quite quickly. We can help you upgrade your SQL Server, with upgrades to SQL Server 2017 even! We also help companies leverage the power of features within SQL 2017, SQL 2016 and SQL 2014 . These database releases contain new features like Adaptive Query Processing, In-Memory Tables, Columnstore Indexes and Page Compression. We also can help with much smaller clients too with SQL Server 2017/2016/2014 Express support. These are but a few of our experiences. We can take the team lead or project manage SQL projects. We're not just database monsters! Gone are the days when SQL Server was just a relational database engine, it is now a feature-rich product steeped in complexity. Microsoft SQL Server has come a very long way. This client-server database has grown to a sophisticated free edition (SQL Express Edition), encompassed mainstream data analysis (Business Intelligence, Data Warehousing, Analysis Services, Reporting Services, Integration Services) and has a much richer development environment attached to it (T-SQL enhancements, every version). Microsoft wants to release a new SQL product every year or so and thus increase functionality. SQL Server is now finally a proper enterprise business database. This database software has evolved remarkably in just three version releases (SQL 2017, 2016, 2014). A database administrator needs to know database programming as well as correct SQL Server maintenance. We can help by custom building databases and we’re also seasoned DBA Administrators too. We’ve also had extensive experience with Transact-SQL (T-SQL) Development and Query Tuning. Perhaps you need a SQL Performance Tuning Consultant, a SQL Developer or a SQL Server Trainer/SQL Consultant. If you need any of these things, then please call us, we can show you how to get the best out of SQL Server. Why can you trust Sequallity? We have worked with both large and small clients, from single stand-alone Small Business Server installations, right up to 250+ SQL Server sites such as Tesco. We have worked for iSoft, Barclays, Phones4u, Wilkinsons, Business Objects, Greenstar, AutoTrader, Marks and Spencer and the NHS amongst many others. Also, we’ve worked with medium-sized companies such as Bravissimo, XMA Computer Products, Coldharbour Systems, Storetech, Qtac, Silverstring, Partybox and FreeIndex. But most of all, we love to help. We have over 24 years experience in the IT industry, of which 19 years have been using SQL Server 6.0, 6.5, 7, 2000, 2005, 2008, 2008 R2, 2012, 2014, 2016 and now 2017. We currently support the four main platforms, SQL Server 2017, SQL Server 2016, SQL Server 2014 and SQL Server 2012. We believe SQL Server 2017 is an Enterprise-class relational database management system. Version 2017, Azure, RDS, 2016, 2014, 2012 or 2008 R2? Well actually we support all these platforms and we will also consider work for SQL Server 2008/2005/2000/7/6.5, if required. It’s because we like to help! IT is about people, meeting people and trying to resolve the challenges that data presents. If you have an emergency, we prefer to dial-in remotely (VPN, MSTSC, TeamViewer) to help resolve the issue (Remote DBA), although we can also get to your site quickly. If its project work then being on-site suits us right down to the ground. We have offices in London and the East Midlands but we can work in The City, London, Manchester, the south-east, north, east or west or indeed anywhere in the UK. Honesty and Integrity are two words we believe firmly in. Trust is very important to us and we try to build this into our relationships with our clients, naturally. Our SQL Server consultants want to do an excellent job, first and foremost. Please check out our clients page and don’t just take our word for it. We are Sequallity, the SQL Server Consultancy, where SQL and Quality join!